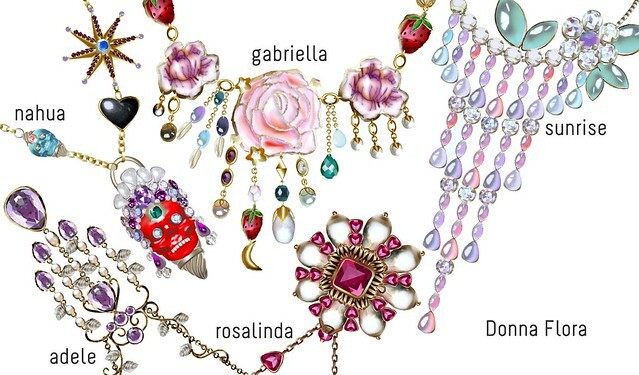 While sorting my inventory today, I realized that I have lots and lots of Donna Flora jewelry! I love this brand so much, and even though Donna Flora has clothes, hair, and shoes, my favorite items are the beautiful jewelry sets. I’ve decided to sort through my huge pile and make a collage of 10 of my favorite Donna Flora necklaces. It was hard to pick just 10, cos there’s soooo many more that are equally beautiful. What about you? Where do you get your jewelry from? 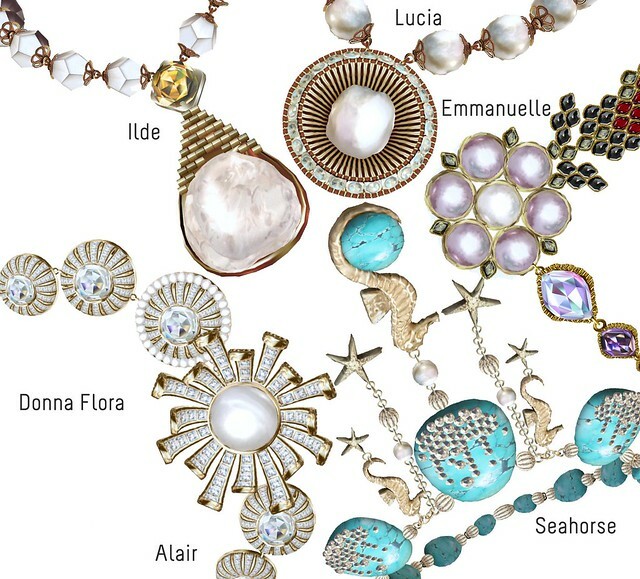 Make a collage of 10 jewelry pieces that you love from any single brand, or a mix of brands in SL! Blog about your favorite brand or make a collage, and submit it to the Blog Challenge group on Flickr. Be sure to share a link in the comments so I can check it out! Those look pretty indeed.. I think I have to visit that store! What a fabulous challenge. I will have to come up with something, too. I know a Rl jeweller who saw pictures of Donna Flora’s jewellery and was impressed. Not only is her stuff creative and elegant, it looks plausible in reality which is a huge attraction to me as a buyer. And, I love Donna Flora because you got me onto Squinternet’s store, Gogo! I have to agree Donna Flora has such pretty elegant stuff. The jewelry is fantastic! Great idea! Squinternet is amazing! I love her designs! Such great attention for detail! Super realistic, ridiculously gorgeous, and most importantly… SHINY! I just want to roll around in a pile of the stuff.